Camphill Community Jerpoint is located in the historic Nore Valley on the banks of the river Nore. It is an area renowned for its arts and crafts and its natural beauty. Jerpoint is home to 28 people including volunteers and residents living in different sized households. All people in the household contribute to the upkeep of the house depending on their ability,we all have something to give. This one of the essential aspects of life sharing. (see under projects our plans for a new farm building) , extensive vegetable and herb garden for own use. The garden/farm is run according to organic standars and wherever possible to biodynamic standards. other day activities like KCAT ( Art and study center in Callan), SOS workshops in Kilkenny, Drama course etc. Our aim is to foster people’s abilities and give people choices. The fact that we work to a large extent with volunteers allows more one to one attention, than would be the case if all people were salaried. All long term co workers (Volunteers) are professionally trained and the volunteers comming for a year attend a training course relevant to their work throughout their stay. 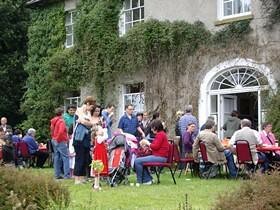 Jerpoint Community benefits greatly from belonging to the lively cultural and social Community of Communities of Camphill centers in the Kilkenny/ Tipperary area.